Typhoon, Taiwan, Hoklo: What do these three words have in common? Actually, let us take a look at the various Chinese character rendering of these three words. Typhoon: 颱風, 大風, 風颱, 風篩, etc. Taiwan: 台灣, 大灣, 台員, 大員, 台圓, 大圓, 台窩灣, etc. Hoklo: 福佬, 福狫, 鶴佬, 學老, 河洛, etc. First of all, we see a multitude of Chinese character renderings for these terms. Secondly, phonetically, the most-often used renderings all have problems, as described below. Taiwan 台灣: the second character 灣 carries the Yin-Ping tone in standard Mandarin and in other Chinese dialects, which is NOT the Yang-Ping tone used in Hoklo. Hoklo 福佬: the character 福 has a Yin-Yang tone mismatch problem: it belongs to the Yin-Ru category, whereas the native pronunciation uses the Yang-Qu tone category. The other often-used rendering 河洛 is even worse: with both syllables carrying wrong tonal categories. What is going on? Chinese language is an isolating and tonal language. Tone values do not accidentally change categories from one dialect to another, especially in the South. Maybe looking at the word order of Typhoon in Hoklo (風颱) can give us some clues. Standard Chinese places adjectives before nouns, that is, the modifier before the modified. On the contrary, Southeast Asian languages like Austronesian, Thai, Vietnamese, all place adjectives after nouns, or the modifier after the modified. Given that this word 風颱 (1) has multiple Chinese character renderings with inconsistent tonal values, (2) follows Austronesian-like word order, one can only conclude that the word 颱 (~Tai) is of a pre-sinitic/non-sinitic origin. - that Hoklo people were originally from Central Plain (黃河, 洛陽). However, modern comparative DNA studies have demonstrated time and again that Hoklo people are closer to their South-East Asian neighbors (Thai, Malay, etc.) than to the Northern Chinese, not to mention the wrong tonal category problem of 河洛. Chinese historical phonology also demonstrates that retroflex non-retroflex distinction has always been part of the language (which Hoklo lacks), so Hoklo can in no ways be the standard Chinese used in ancient times. Also, this term 河洛 did not appear in written records until modern times: an invention attributed to 連橫 (Lian Heng), first used in his 1918 book titled 台灣通史. In short, the Central Plain explanation is misleading and is baseless. - that Hoklo was a derrogatory term first given to these people by the Hakka or the Cantonese, and that this term was later imported into Hoklo. This conjecture does not seem likely, because Hoklo was also the term used by European missionaries to refer to the people in their congregations. It is highly unlikely that the missionaries would use a derrogatory term in this context. On the contrary, it is more likely that the European missionaries used a term that the native speakers themselves had chosen. As explained elsewhere, the letter k in Hoklo is probably an unreleased glottal stop h, which is mapped to Cantonese velar stop k (a phenomenon also observed in some Hoklo sub-dialects in Guang-Dong area, e.g: Hai-Feng, Lu-Feng) because of the lack of final glottal stop in that language. 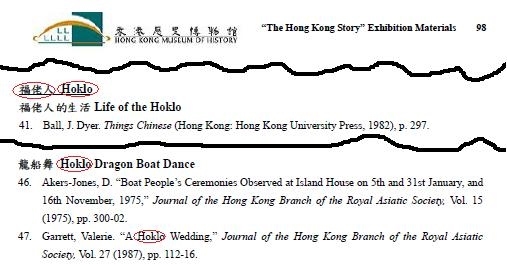 Notice that the usage of both the English term Hoklo and the Chinese terms 福佬 or 學佬 are well documented in Hong Kong administrative documents during British colonial era (a citation is also found in Scientific American in 1845 A.D.), and that independently in Taiwan the Hoklo population has been using its native pronunciation since centuries ago. It should be clear that, instead of resorting to esoteric explanations, a simpler explanation would be: (1) that the term Hoklo is of non-sinitic origin, (2) that this is the term used by these people to refer to themselves, no matter where they lived.